Meet your guide in Central Madrid and take a private, air-conditioned mini-bus to Toledo. After stopping at one of the city’s most famous viewpoints, walk through the old Jewish Quarter and step inside a sword-making workshop. Take a full behind the scenes tour of the workshop and learn about the ancient techniques that made Toledan swords the most sought-after weapons in medieval Europe. Next, take a full tour of the Toledo Cathedral led by your expert guide. The Cathedral is one of the most beautiful gothic churches in the world and its filled with architectural marvels and great works of art. Seeing it will be one of the highlights of your trip. Afterward, head over to the Tower of San Ildefonso - the highest viewpoint in Toledo - for stunning views over the city and nearby Alcázar. Lunch is not included, but your guide will give you recommendations on where to go to sample local specialties like lamb, partridge, and marzipan. In the afternoon, drive to the iconic windmills of La Mancha that were made famous by the book Don Quixote. 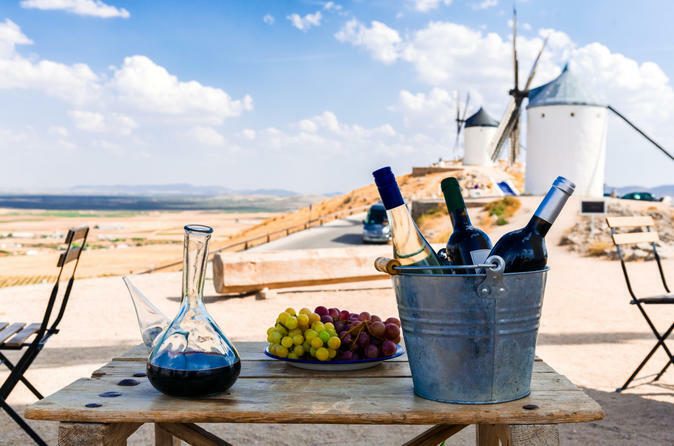 Tour the only working windmill, learn what made it so important and why Don Quixote is still popular more than 400 years after its publication. For the perfect end to your day, stop off at the windmill's cafe for a tasting of manchego cheese with a glass of wine, beer, or a soft drink and beautiful views over the countryside. Relax and indulge yourself - it’s a quick hour and a half back to Madrid where you’ll arrive with plenty of time to prepare for a late Spanish dinner.